Clients leave us, and most times we blame someone else…we call it “twisting” or “churning”. The immediate inference is the client only left because somebody else – who is less ethical – took perfectly good business and moved it for no reason other than their own gain. Twisting becomes the acceptable explanation as to why a client left a wonderful adviser (good person!) and great products or plans to head somewhere else (bad person!). This is probably the most contentious issue in the financial services industry: clients moving advisers, or moving to different product suppliers. Advisers and suppliers alike disparagingly refer to any such shifts where another adviser is being the result of “twisters” and “churners”, but interestingly, one rarely hears the industry talking about the customer motivation for moving firms or products though. It is simplistic to assume that customers move only because they obtained a slightly cheaper price elsewhere. It may be true that trimming a minor percentage in costs is a motivator for some, though it would not be true to suggest that this is the primary reason that customers move in the main. If we accept that financial advice and financial products are considered complex, time-consuming, and a downright drag for most consumers, then it follows that they are not likely to go through all the hassle of switching everything to save just a few dollars a month. It is just as untrue and simplistic to assume that “the other adviser” who helps a client shift is doing something wrong. Oftentimes in my experience they are actually doing a much better job for the client than the incumbent adviser who has barely been in touch and hasn’t engaged in a full review of detailed advice for many years. If I am permitted to be a little cynical for a moment, it is worth noting that replacement business is only called churning or twisting when it is going away from you. That is, when you are losing a client it is appropriate to label the competitor as unethical; yet; when it is coming to you, and your firm is picking up the client from your competitor, that is not twisting it seems. A hypocrisy which is conveniently ignored most of the time within the industry. Inevitably when there is little organic growth in the industry then competition for existing industry customers lifts in intensity, and there are advisers and firms alike who deliberately set out to take existing customers away from other industry participants as a means of growing their own business. I would wager that this tactic exists in most business sectors most of the time, so it hardly seems aberrant behavior. That is; it is a normal activity of virtually every commercial sector. Of course, it DOESN’T seem to exist as an acceptable business tactic in the “Professions”. Of course as we all know, one of the defining hallmarks of a profession is this simple concept of “putting the customers interests first“. So let’s do that. Let’s look at a superb piece of data that tells us what actually motivates customers to decide that despite the complexity and hassle factors, they are going to move firms and products. Despite the fact that this research is focused upon financial planning clients (and it was from a few years ago), there are lessons for all financial advisers here. 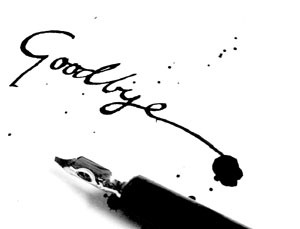 The primary lesson is price is not suggested as a key reason for leaving an advisory firm. 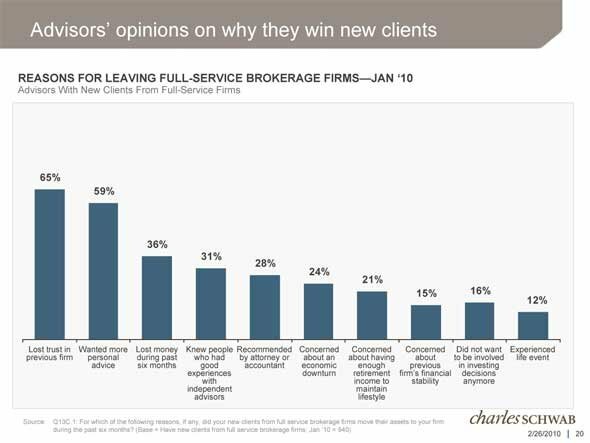 Let’s be brutally clear here; the 2 standout reasons why clients move is because they lose trust in the advisory firm and they wanted more personal advice. Clearly there is a backlash effect at work as well, in that when product performance suffers then clients become dissatisfied, and that is just as true for lending or risk clients as it is for financial planning or investment clients. Well, that is fair enough actually and we have to cop that one on the chin as that would be the same in any industry: if a recommended product or service does not perform satisfactorily then clients will become dissatisfied and leave. As consumers ourselves that is what we would do, so we shouldn’t ignore the fact that our clients will too. For all that though, there is little doubt that maintaining trust and delivering personalised advice are the two key battleground issues for retaining clients. To do this successfully means lifting the communication levels and maintaining a constant presence in the clients mind. These are two things that the advice sector has been fairly casual about for a very long time, and consumers are now letting you know that these things matter because if you don’t deliver on them they will walk. This is where financial advisers have to win their own war for client support. Because that other adviser…the twister? Usually they are simply a catalyst. The client is already fundamentally dissatisfied to some degree but didn’t necessarily see an alternative course of action until someone else spoke to them of different possibilities and offered to help. So the other adviser is not really the problem: if we had done our work well the adviser wouldn’t get a look in. Client twisting? If it happens regularly or there is a reasonably high proportion of your clients being twisted then one has to accept that actually we probably deserved to lose them, because in a sense we already had lost their support and confidence anyway. We had lost them before they actually said goodbye to us….so maybe it isn’t the twisters fault at all. Maybe it is our own. I agree. If you continue to provide valued on-going personal service then the clients shouldn’t be tempted to move. Could I be as bold as to question whether ‘renewal commission for life’ is another culprit in causing churn? Does it let advisers become lazy and not provide the on-going service / reviews which helps provide value and retain client trust? If another adviser is invited to provide this service then the easiest way for the new adviser to get rewarded for the work done is to write new business elsewhere. But isn’t the then new commission for the valued existing adviser of 230% (or whatever) is a good reason to ensure the client is well serviced. But hey, who dangles the carrot, so who can take the blame? You may well be onto something there!